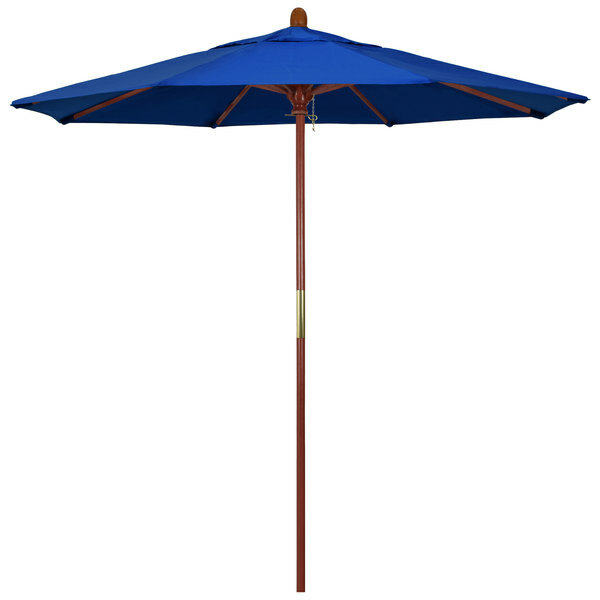 Keep your decks, outdoor dining areas, or pool-side patios shaded with this California Umbrella MARE 758 PACIFICA Grove 7 1/2' round push lift umbrella with 1 1/2" hardwood pole. With a classic design and warm, natural coloring, the Grove series offers umbrellas that are both visually-appealing and sturdy. This umbrella features a 1 1/2" thick hardwood pole with sleek, stainless steel hardware for a robust foundation. Its durable hardwood ribs provide excellent support for the canopy and boasts earthy tones that blend in perfectly with outdoor settings. In addition, the single wind vent allows for sufficient air flow to ensure stability and prevent the umbrella from moving with strong wind gusts. The canopy's Pacifica fabric is made of solution-dyed polyester that has been perfected to maintain its vibrant coloring. In fact, the strong fiber blend holds its color 4 times longer than traditional polyester fabrics under the same conditions. It's sure to provide a professional look for years to come.